There is a lot of confusion about what the law really says about service dogs and other service animals. To give you a better understanding of service dog laws, here are some key points you should know. First, we must define the difference between a ‘service dog’ and a ‘therapy dog.’ The American Disabilities Act defines a service animal as a dog TRAINED to perform tasks for a person with disabilities. Whatever task a service dog performs must be directly related to the disability. A dog trained to alert a diabetic when their blood sugar is out of the norm. Dogs trained to detect the onset of seizures. A dog trained to recognize increasing anxiety and respond to help with PTSD. Dogs that only provide emotional support or act as companion animals do not qualify as service dogs. For instance, a service dog trained to sense an anxiety attack and respond in a trained way to mitigate the attack qualifies, but a dog that helps calm an individual and prevent anxiety attacks just by being a dog, does not. 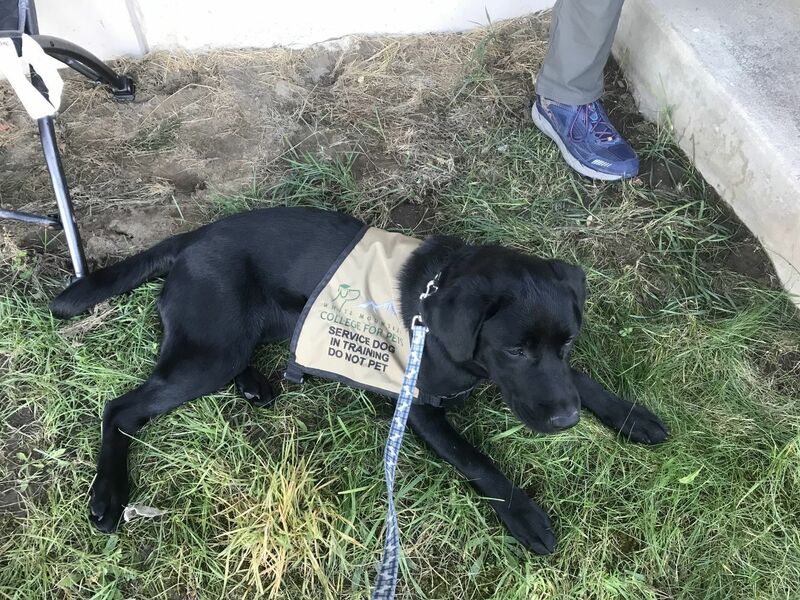 The presence of trained tasks that help to mitigate the handler’s disability is the main factor separating service dogs from emotional support dogs. Does the law require service dogs to be professionally trained? The ADA does not require a dog to undergo professional training. Owner-trained service dogs are common and can be a viable alternative for those who already own a suitable dog or are unable to afford a program trained dog. Keep in mind that the key lies in having a fully-trained dog. 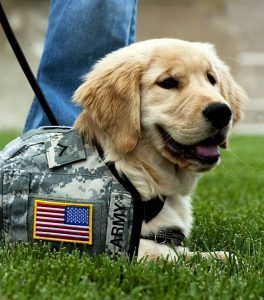 Service dogs in training are not allowed in “no dogs allowed” public places except in certain states. If you take your dog into a restaurant and he starts acting up, it doesn’t matter what their vest says, you will probably be asked to leave. NOTE: The law does not require service animals to wear a vest or any type of ID tag or harness. However, it does prevent confusion and eliminates interference by other people. Most individuals know to leave a service dog alone while he is working. There are certain service dog laws that you should be familiar with in order to protect your rights. For instance, a business owner or an employer can only ask you two questions regarding your service dog. Is your service dog required because of a disability? What task has the dog been trained to perform? You can take your service dog into restaurants and they can even go with you to a salad bar or buffet. The only stipulation is that your dog cannot block pathways. While eating, they generally sit under the table or at your side. A hotel cannot refuse accommodations for a service dog even if they do not allow pets. Further, a hotel cannot limit a service dog to ‘pet-only’ rooms. You have the right to reserve any room that is available to someone without a service animal. Upon checkout, a hotel cannot charge you extra for cleaning but they can charge you for damages, just as they would any other patron. Common courtesy is to bring a blanket from home if your dog will be on the furniture. NOTE: You cannot leave a service dog alone in a hotel room. They must be under your control at all times. Service dog laws state that a hospital cannot prevent you from bringing your service dog when you check in. However, if the patient is too ill to take care of their own animal and a family member is not available to do so, then the hospital can request that put your animal in a boarding facility. Every service dog handler should have an emergency plan in the event of situations such as this. Service dogs are not allowed in sterile areas such as operating rooms. Hospitals will make every effort to allow service dogs to stay with their handlers. They recognize the valuable service the animal provides. You must abide by all local registration and vaccination laws that apply to ALL animals. Many states provide free town dog registration to service dogs. It is important to have your dog registered with the town in the event of escape or separation from you. Emergency personnel that locate your dog will have means to trace it back to you. This is not referring to a “service dog registration” but the registration that all towns require for any dog in its jurisdiction. Even if local regulations prohibit residents from owning certain breeds, establishments can’t refuse public access to your service animal based on their breed. However, if your animal is not under control, business owners can request you leave the premises. For more information regarding the ADA and service dog regulations, you can click HERE. If you want more information regarding owner-trained service dogs, contact Mike Robertson at College for Pets. 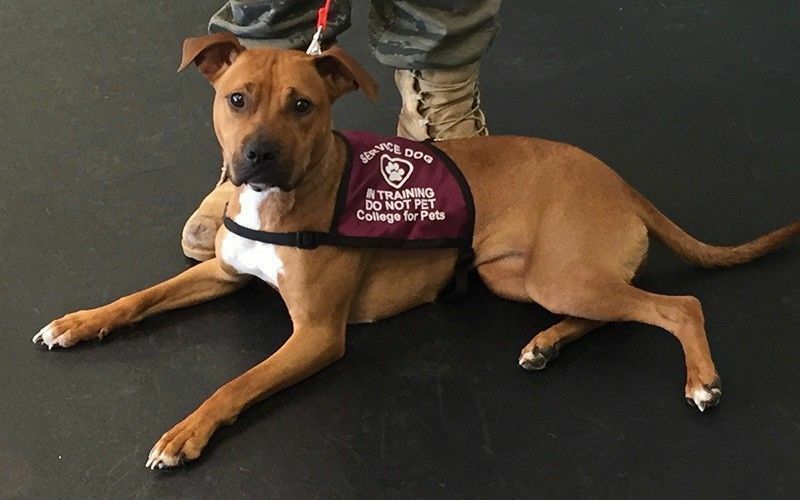 College for Pets offers counseling and training classes specifically for handlers wanting to train their own service dog.